"Edutainment at its best!" - "Brilliant!" - "Engrossing and enthralling!" "Just wanted to drop you a line to say a big Thank You for your performances yesterday. They were outstanding as always. A fantastic time was had by all." Click here for some more reviews...! With a background as a science teacher, becoming part of Johnny Ball's "Living History of Science" team seemed inevitable, combining all of David's skills. 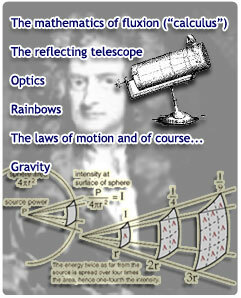 Since 1996 he has been entertaining and educating audiences nationwide as a flamboyant Sir Isaac Newton. 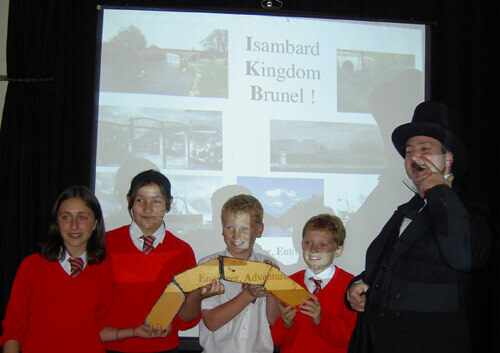 In 2001 he added Isambard Kingdom Brunel to his repertoire and in the same year Sir Isaac opened the Southwold Summer Festival's lunchtime season to great acclaim. He has even proved very popular with the WI..! 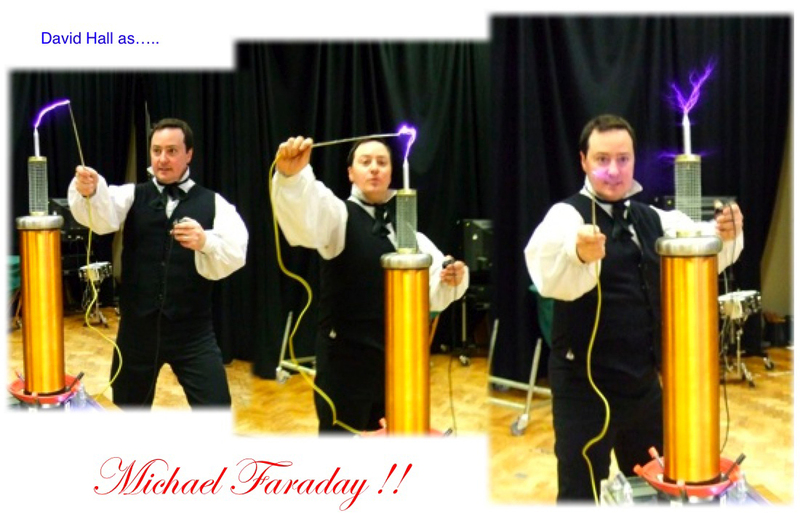 2008 saw the arrival of Einstein and 2009 Michael Faraday. 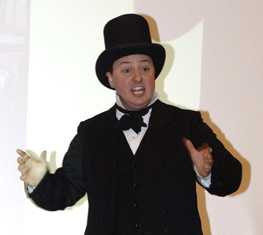 Since then he's developed his highly popular Mathmagics presentations, an Alexander Graham Bell show, The Great Fire Project and more - all of which have been received extremely well in schools and other venues across the country. 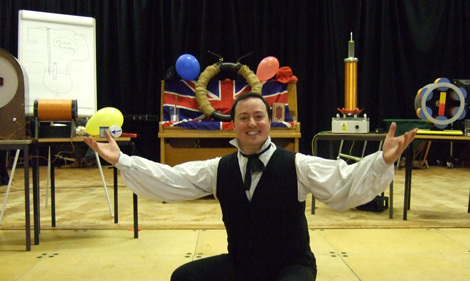 Ideal for KS2 and KS3 all David's shows have been greatly enjoyed by KS1 and KS4 as well. In fact there is something in each for everyone..!! David's is also the voice of the glossary for many of the CDRoms accompanying Science Textbooks published by Longman, AQA, Edexcel, Pearson Education and more..! 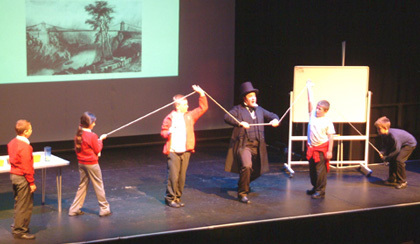 In addition to his hugely popular and successful Johnny Ball shows, David also now presents Mathmagics, an interactive maths show, adapable for ll ages and developed alongside Johnny Ball, unforgettable interactive lectures on Spectrometry, Atomic Structure and Nuclear Power and is the co-creator of "Maths Circus" a circus-themed maths workshop. "The Workshop was great. The children were involved. Enthusiastic, hands-on approach. Very practical. Good questioning at the right level." For more information, click the quote above. or email Johnny or David. For David's own projects, email or call David directly on 07973 429 716. For details of the individual shows, see below or click the links above. Short notice enquiries for bookings are always welcome. Meet Sir Isaac Newton is a fast moving, often hilarious, yet hugely informative one-man-show conceived, written and directed by Johnny Ball ("Think of a Number" etc) and performed by actor and former science teacher David Hall (English Shakespeare Co, the BBC's Big Toe Radio Show, The National Theatre in London's West End and London's Young Vic Theatre). Sir Isaac Newton explodes into the room and an hour later has told you of his life and achievements as well as demonstrated (frequently using members of the audience as volunteers) many of his ground breaking theories and discoveries - with many a squirmingly corny joke along the way..
..as well as the achievements of some of the giants upon whose shoulders he stood: Archimedes, Kepler and Galileo. 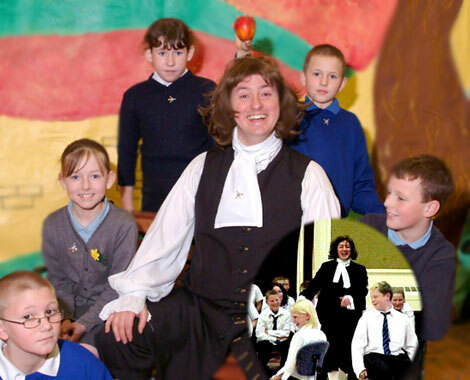 Meet Sir Isaac Newton is guaranteed to entertain and inspire even the least ?scientifically minded? from age 7 upwards. You will be amazed what you can understand and how much fun science can be...! Meet Sir Isaac Newton has been performed to universal acclaim in schools and colleges throughout the country, secondary, primary and special, as well as for the British Association for the Advancement of Science, Kent's ASE, the Southwold Summer Festival, the Jodrell Bank Science Centre and even the WI...! 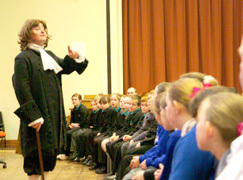 "All pupils, including a number of Year 6 pupils from visiting primary schools, were enthralled." "They gained knowledge not only of the wide range of Newton's theories but also the background history to the times." "A professional and well prepared show." Helen Isherwood KS3 coordinator, The Radclyffe School, Oldham. 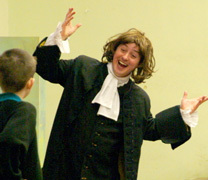 "Sir Isaac Newton, played by David Hall, was a great hit. He brings enthusiasm, vitality and realism to the character and his audience were transfixed. This was Edutainment at its best. We'll certainly have him back." Dr David Lewis, Uppingham School, Rutland. "The talk by Isaac Newton was discussed endlessly on the way home and again in class the next day. It made a big impression." Paul Ridd, Head of Science, Tonbridge School. "What a complete joy it was, AND we learned a lot. It was a fab performance - totally captivating the room and making us all believe we really were in the presence of the great man"
"I really learned a lot about what Sir Isaac Newton did! " "I didn't realise that he did so much and invented so many things! " "He was really funny! " "I wish my science teacher was as good as him! " "Very interesting and I am not a science teacher!" "I bet the kids have learned a lot of science without realising it!" "Good pace and well presented!" "I was enthralled from beginning to end!" "He put across the discoveries of Sir Isaac Newton in a humorous but well organised thorough way. I was impressed!" "Hope to see you again next year!" One of Britain's greatest ever engineers and voted sixth in the BBC's Great Britons contest (Newton was fourth), the irrepressible Isambard Kingdom Brunel was a man for whom nothing was impossible and whose achievements changed the face not only of Britain, but of the world. A truly inspiring example to us all! "MANY thanks for the superb show you put on for us on Friday. The children and their teachers thought the show was fantastic, and I know the boys came out singing the IKB song! It was all very impressive, indeed." IKB with pupils from Fowey Community College, Cornwall. The magnificent Clifton Suspension Bridge, deemed by Telford to be over ambitious and impossibly wide. The (literally) groundbreaking Thames Tunnel at Rotherhithe, a project of his father Marc from whom Isambard took over at the age of only twenty. The technology by which this tunnel was made through the waterlogged and porous soils under the Thames was adopted as the new tunnelling technique for the world. There were five floodings and dozens of deaths, yet Brunel persevered and after eighteen years the first tunnel in the world under a metropolitan river was opened. It is still there and still in use to this day! When even the great miner and engineer Trevithick failed even to sink a shaft, how did he do it? Brunel will explain! The Great Western Railway, a railway that literally changed time as timetables had to be drawn up which worked from East to West and back again. Six weeks on horseback (at the age of twenty-six) to survey the route which became known as Brunel's Billiard Table. An adventure in architecture: not only did he create the means to build the railway, but Brunel designed all the stations and sidings along the way as an architectural tour form the Great Glass Arches at Paddington to the Castle at Bristol Temple Meads. Brunel's railway was wider, faster and safer than any railway before or since. Along the way he will explain the sweeping elliptical arches crossing the Thames at Maidenhead (made famous in Turner's epic "Rain Steam and Speed") - they said it couldn't be done, but he did it! - and the famous two-mile long Box Tunnel, the longest tunnel in the world at the time (again deemed an impossibility). the Great Eastern: the first the fastest passenger ship ever to cross the Atlantic (once in just 12 days and 6 hours! ), the second a truly ground-breaking vessel, full of firsts: the first screw-driven ship, the first iron ship, the biggest ship in the world with the biggest engines ever made, an entirely new kind of rudder (which still compares extremely favourably with the most advanced designs of today), whole new construction techniques were designed to make her and she is the forerunner of all modern ocean-going liners of today. The Great Britain sailed 31 times around the world covering over a million nautical miles in her 90 years (!) of service - and Brunel conceived and built her! And finally The Great Eastern Steamship: 240 metres long, 30 000 tonnes, a propeller and paddle wheels, she could carry enough fuel to take her to the other side of the world and she required two neighbouring shipyards on the Thames to build her - her launch chains may be seen behind Brunel on his famous picture. But why build such a vessel? Again, the unstoppable IK Brunel will explain...! 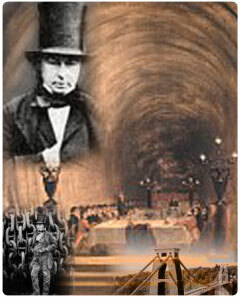 Through his achievements, peppered with his extraordinary adventures - and with the help of many intrepid volunteers from the audience - Brunel covers many of the essential processes of Physics and Engineering: forces, bridges, arches and much more, but above all this he demonstrates how, if you put your mind to it and are not daunted by criticism or the possibility of failure, you can achieve anything! "Just because it hasn't been done before, doesn't mean it can't be done!" All you have to do is decide to do it, put your mind to it and begin ! "Thank you for coming to the Discovery Zone at Lincolnshire Show 2006, the feedback from people we have spoken to has been terrific. Your visit really added a highlight to the area for everyone." 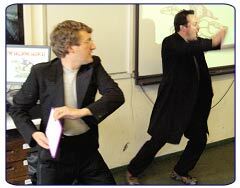 "I wanted to forward a belated thank you for entertaining the youngsters of Ellesmere Port junior schools last month. The shows were very successful and well received. I would be interested in booking again for next year "
Another shockingly inspiring show from Johnny Ball's repertoire, David brings to life Michael Faraday, demonstrating and explaining the origins of his work on electricity, his acheivements and how they impact and effect us now in our 21st Century Electrical Wonderland. 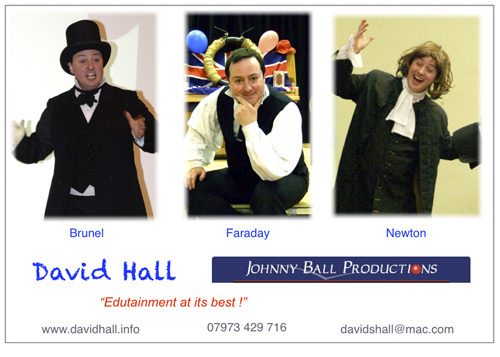 For more information contact: davidshall@mac.com or Johnny Ball Productions. Albert Einstein: Relativity, E=mc2 and beyond...!! Again developed alongside Johnny Ball, David now offers an Albert Einstein show - commissioned by one of the schools he visits annually. To find out more email: davidshall@mac.com or Johnny Ball Productions. Seeing the Buoyant Force in Action! 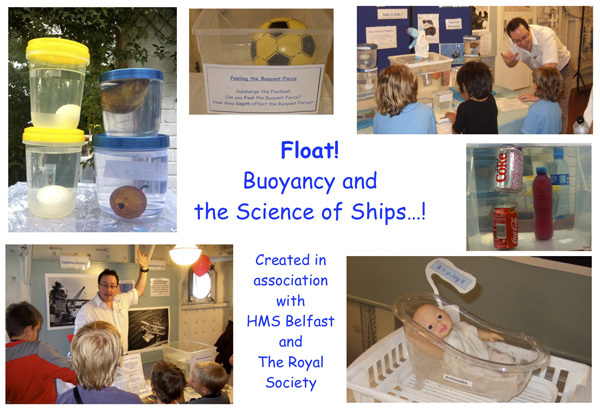 to the Physics of Buoyancy and the Science of Ships! 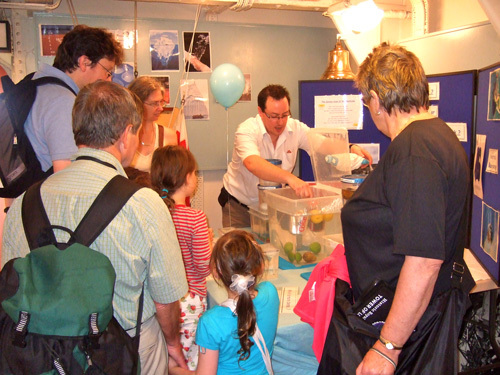 "We were absolutely delighted with the time we spent there and were extremely impressed with both the displays and your interaction with the children, helping our boys to understand the various principles of science associated with water displacement, buoyancy, water pressure, etc. They loved every minute. I'll be passing your information on to our local schools, as I can really see how your sort of presentation could enrich their education programmes immensely. 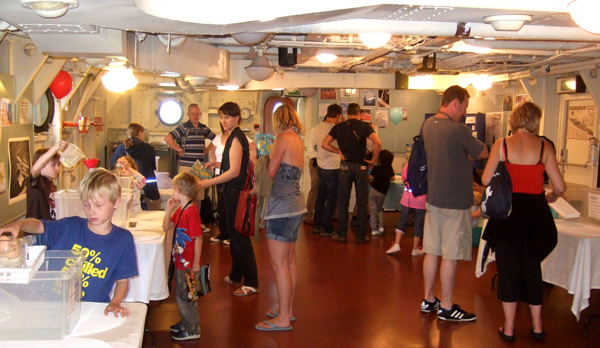 Spanning seven tables, which may be encountered in order or as part of a carousel of experiments, participants are encouraged to investigate and experience what buoyancy is, how strong the buoyant force actually is and what actually causes it - alongside investigating and finding out about key concepts such as stability and streamlining and their importance in the deign of ships. what makes things float anyway..!!! Another popular interactive show for all ages including David's characteristically fun and quite unforgettable interactive demonstrations. 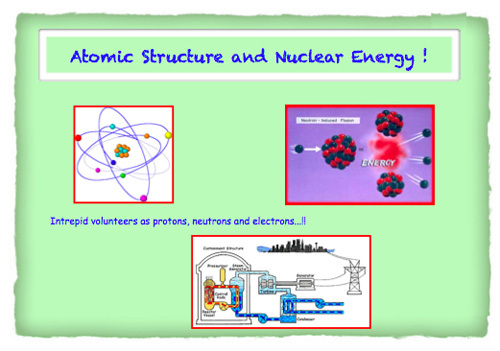 Atomic Structure, Isotopes, Bonding and States of Matter are all covered, leading to an understanding how we can harness the energy from nuclei themselves to generate electricity. Why do scientists use it? How do the compounds they analyse relate to our everyday lives? And what's all that got to do with microwave ovens and babies' toys..? 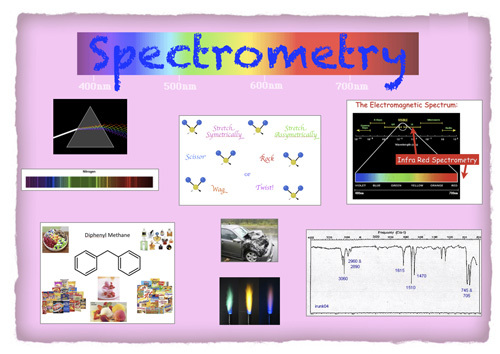 Brush up your understanding of Colours, Sounds and the Electromagnetic Spectrum, discover how and why bonds move and how lying on a beach can help us find out about neon lights in this entertaining and absorbing interactive lecture, specially developed for the Kent Education and Business partnership. A brilliant, animated and interactive lecture highlighting the amazing worlds of Mathematics and teaching some excellent tricks along the way.!! 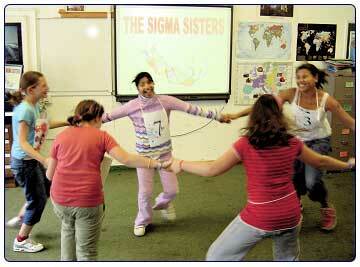 Highly adaptable, motivating and fun for all ages and abilities. "Inspired our top Year 8s, even engaged and motivated the low ability Year 11s ~ and astounded the teachers too! We'll definitely rebook." John Harding, Royston High School, Barnsley. "Another engrossing and enthralling session that exercised the grey matter. Absolutely brilliant. Everybody really enjoyed themselves. There have been a lot of happy faces, and inspired , enthused and uplifted children here. So thank you and thank you again." Shelagh Edwards, Gifted and Talented co-ordinator, Chesham. and a great resource for teachers too..!! ...whilst giving teachers tried and tested, active and interactive, innovative, physical and highly enjoyable new techniques for teaching and reinforcing basic number skills. In a two day event the students firm up on number bonds, master multiplication tables once considered unmasterable, reinforce their understanding of factors, common factors, multiples, primes, place values (even simple equations) and generally have a great time in the process. The whole event culminates in a circus-themed performance to an invited audience celebrating and demonstrating the various skills they have acquired ! 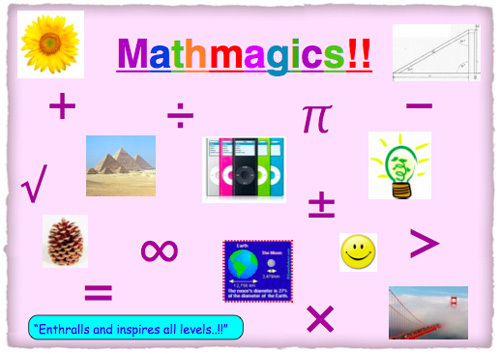 A unique resource for teachers looking to teach maths in an active, fun and highly memorable way. 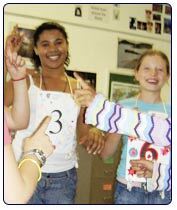 Maths Circus not only develops maths skills but also encompasses and encourages team-work, creativity and expressiveness too. It is ideal for years 6 and 7, though it works excellently with other ages too. Feedback received includes: "Great fun!? and ?I wish we could have done more maths"
or email him by clicking here ! 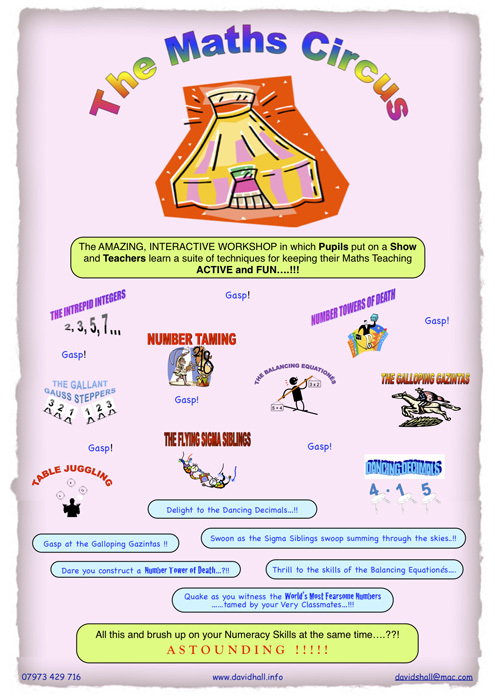 Maths Circus - a dynamic, fun, inspiring and original way to learn and revise numeracy skills - and a superb resource for teachers !! aka "The Great Conflagration - How would you rebuild your city.?!" In the midst of your assembly or class - and quite unannounced - the renowned diarists Samuel Pepys and John Evelyn burst into the room - in the midst, the very midst - of the Great Fire of London of 1666...!! How can they fight it? What have they seen and heard? And what if it happened now? In your very town or city..?! How might that be rebuilt...?! Using contemporary accounts, modern research and the words of these two great diarists, David Hall and Clive Greenwood (Theatre Museum, Maritime Museum, Science Museum, Imperial War Museum at al) recreate the drama, panic, sights and scenes of "The Most Lamentable Conflagration" - and lead your pupils to consider: how would they rebuild their area if they were to start again from scratch...? What would stay? What change? What traditions or elements should be saved? How would their design reflect our modern world, its laws and needs? Places of worship, public amenities? Transport systems, accesibility, materials, technologies: all these need to be considered. What is actually necessary and what a luxury? And what are their responsibilities to the people who live and/or work there and shall do in the future? What are their responisbilities to the environment? Some schools have even secured a local Town Planner to judge their pupils' work...! What we will provide is an introductory event of high impact, historical accuracy and poignancy and a springboard to questioning what is important - or even vital - to a community. An historical project looking to the future... which may be linked to the widest range of curriculum areas. David Hall and Clive Greenwood as Samuel Pepys and Sir John Evelyn: an unforgettable stimulus to launch a fascinating project. For more information contact David on 07973 429 716 or email by clicking here! 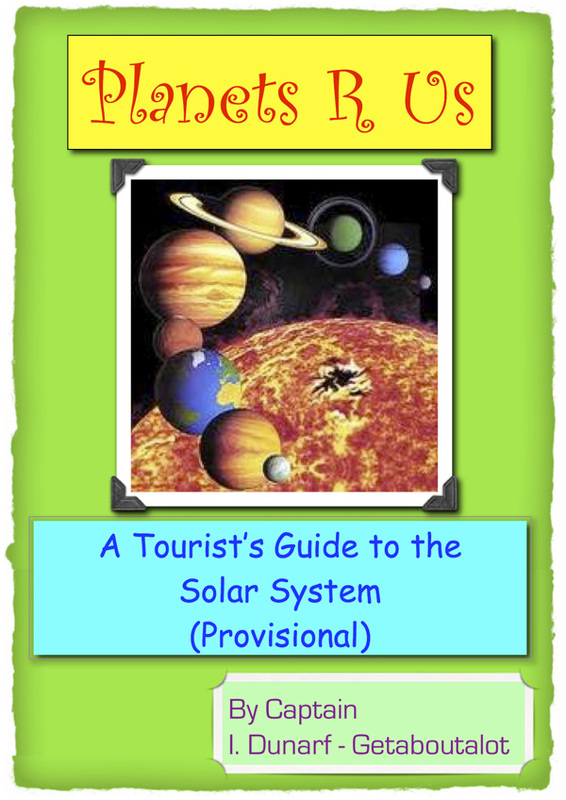 The Solar System - a Dramatic Voyage across the Solar System...! Launch your pupils into space ! gathering information for his very next Tourists' Guide..! that they (and you) will never forget..!.